This week, the architect of the ongoing humanitarian disaster in Yemen, Saudi Crown Prince Mohammad Bin Salman, visits the UK, as Theresa May seeks to secure more lucrative deals for the UK arms industry. We can't let this shameful visit pass in silence, writes Andrew Smith of the Campaign Against Arms Trade. Last Wednesday, nine civilians were killed by Saudi air strikes in north Yemen. The assaults were barely reported: a sign of how long the war has endured, and how regular these atrocities have become. Three years of bombardment has ensured that almost nowhere is safe: with a refugee camp, a wedding, a market and even a funeral having all been turned into the scenes of massacres. There is no way of knowing the true death toll from the war. The UN has said that over 10,000 people have been killed, but that figure is over a year old, and predates the cholera outbreak, which Oxfam has called the worst on record. Analysis from Save the Children has found that 130 children are dying every day as a result of the humanitarian catastrophe, with over 50,000 having died in 2017 alone. The architect of the brutal war will be touching down in London tomorrow. At only 32 years of age, the Crown Prince of Saudi Arabia, Mohammad Bin Salman, may be young, but he has overseen the three year bombing campaign since day one. His trip will include high-level meetings, newspaper puff-pieces and friendly photo-ops with government ministers and Royalty. In short, it will present a major propaganda victory and a chance to flex his political muscles on the world stage. We will no doubt hear lots of hyperbolic platitudes about the small-scale reforms and cosmetic changes that he has brought in Saudi Arabia. However, he will say nothing about the appalling repression that has been inflicted on the Saudi people, or the thousands that have been killed by the deadly war on Yemen he has spearheaded. There is no doubt that arms sales will be on top of the agenda. For years now, BAE Systems has been trying to confirm the sale of a new batch of fighter jets to the Saudi military. Their efforts have been supported by Whitehall, with Ministers and civil servants working to secure a deal. Irrespective of a new deal, Saudi Arabia is already by far the largest buyer of UK arms, and has been for decades. Major arms deals took place under Thatcher, Blair and Cameron. It is a long and inglorious tradition that Theresa May has indicated she will pull out all stops to continue. Since the devastating war in Yemen began, the UK government has licensed almost £5 billion worth of arms to the Saudi military. Right now, UK made fighter jets are being flown over Yemen by UK-trained military personnel and firing UK-made bombs and missiles. The arms being pushed by Downing Street this week could be used in atrocities for years to come. There are no controls over how these weapons will be used once they have left the UK, or who they will be used against. Arms sales may have been promoted by successive governments, but poll after poll has shown they are opposed by the vast majority of people in the UK. For far too long, Westminster has looked the other way and willingly ignored the awful atrocities being committed by the Saudi dictatorship. This hasn’t been a coincidence, it is by design. This was implied last year when the then Defence Secretary, Michael Fallon, urged opposition MPs to stop criticising the Saudi authorities in case it undermined future arms sales. A lot is riding on the visit, with Downing Street promising that it will “usher in a new era in bilateral relations” between the two countries. A successful visit will be welcomed and celebrated in the palaces of Riyadh. It would be seen by the image conscious regime as another major step towards international legitimacy. 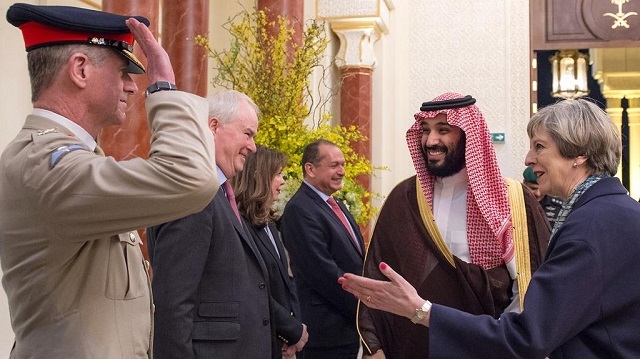 It wouldn’t just be Saudi Royalty celebrating, it would also be the board rooms of arms companies like BAE, that have actively profited from the repression and conflict. They will see it as another great business opportunity and a chance to cash-in. That is why a protest has been called for 5pm on Wednesday 07 March outside Downing Street, with activists from across the UK holding similar local events. Join us in sending the message loudly and clearly that the Crown Prince is not welcome.